All junior size units are interchangeable with all junior size filters. So, if you purchased a Baby’s Breath® unit and would like to upgrade, simply purchase a junior size filter that suits your needs. STAGE 1 – Large Particle Pre-filter. Removes particles easily seen by the naked eye (e.g. dust, hair and pet dander). STAGE 2 – Medium Particle Pre-filter. Removes small to medium size particles (e.g. molds, spores and pollen). STAGE 3 – 30 sq. ft. of True Medical Grade HEPA. Removes 99.97% of all particles larger than 0.3 microns and 95% of all particles larger than 0.1 microns. STAGE 4 – HEGA Carbon Cloth. HEGA (High Efficiency Gas Arrestance), providing an extremely large surface area for adsorption of chemicals, gasses, viruses and bacteria. 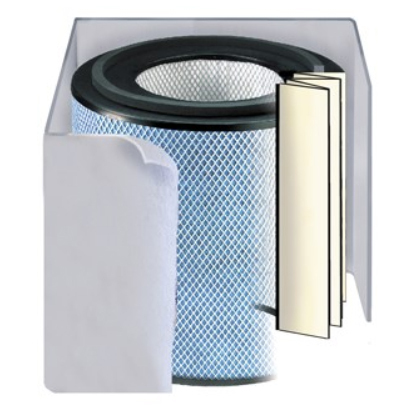 You can check the size of your existing filter by looking for a label on the underside. Model HM200 indicates junior size filter.